Winter bass fishing is tough. The bass will hole up in inconsistent areas and are very lethargic when it comes to pursuing food. In addition, the frequent weather changes that we experience in Florida make them even more likely to constantly change locations so they can be anywhere from a few feet from the shore to the deepest part of the lake. It makes fishing very tough, but also very rewarding. Recently in the newspaper there have been several articles about winter bass fishing down in the everglades. Fishermen in the glades have been having 100-fish days using shaky head jigs and fishing the canals of Alligator Alley that currently have low water levels. Of course, fishing differs depending on the lake and environment, however, here are some basic tips that can help you locate the winter bass with the right lures. In the winter the cold water makes the bass very dormant and lethargic, and they like to hover at the deep water levels where the water is the warmest. Typically after a prolonged period of sub 40 degree weather the bass will go deep. However, due to our unpredictable Florida weather, the temperature changes in our ‘winter’ can make bass change their behavior sporadically. If you have a boat and a fishfinder, search out the deep holes in the lake and drop your lures there. Another key place bass tend to gather are near deep drop offs. Obviously if you are stuck without a boat or a fish finder, this inevitably makes catching fish much more difficult. However bass will come into the shallows, and knowing key areas will ultimately help. 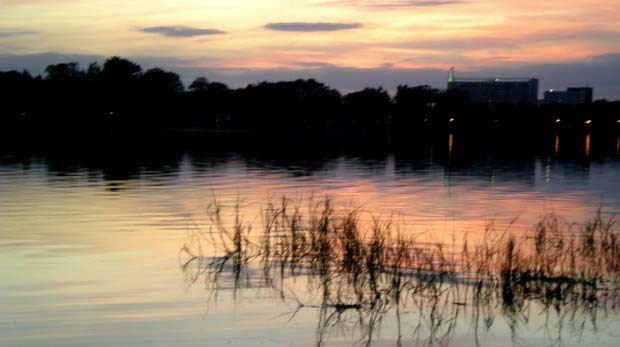 Weed Lines: Florida lakes do not tend to have as steep of drop offs as other areas, so a good place to resort to is the weed line. Shallow Areas of Water Sheltered from Cold Front Winds: Bass will hole up in these areas close to shore with protection from the wind. Shaky Head Jig – The weather has less of an influence on the shaky head jig, therefore it works very well when fishing pressured areas, or during winter. It is a simple rig and it is very easy to use. It consists of a lead jig head with a rubber worm thrown on the end. When the jig sinks, the tail of the worm floats up (this is the part that shakes) so make sure to use a worm with a long tail that is at least neutrally if not completely buoyant. 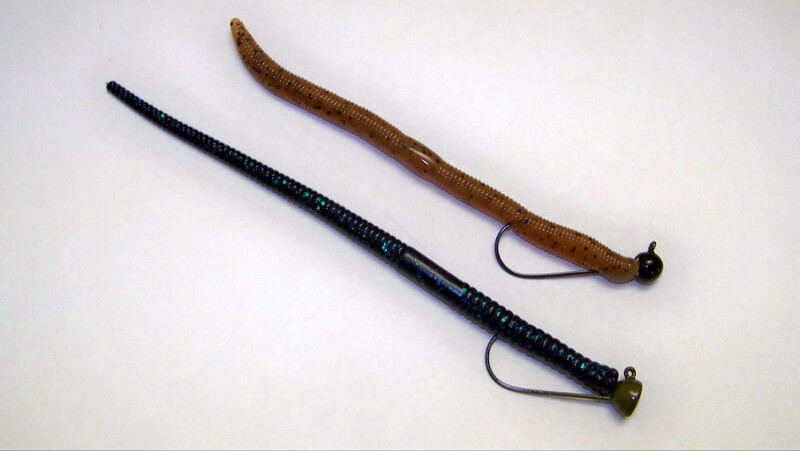 Five to six inch worms with a thin body work best with this setup, such as the Kinami Kut Tail, the Zoom Mag Shaky Head Worms, or BPS Flickin’ N Shimmy. The worms are either nose hooked or Texposed. I use either Shaky Head Strike King Jig Heads 3/16 oz, the Spot Remover Shaky Head Jig Heads ¼oz, or Owner Stand Up Type Round Bend 90 Jig Hook 3/0 ¼oz, for jig heads depending on the area I am fishing. 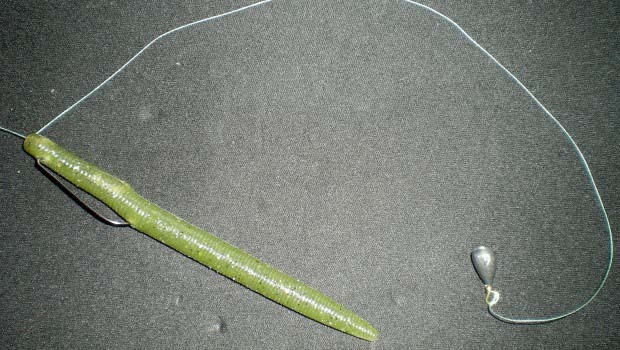 Wacky Worm Rig – A wacky worm rig works very well for fishing after a cold front has come through. It presents the worm in a different way and provides plenty of action to catch the attention of the bass. The rig can cause problems if there are prevalent weeds in the area you are fishing due to the exposed hook. Gamakgatsu, Owner, and Mustad make hooks that include a weed guard or a thin strip of wire over the point of the hook for wacky rigging. 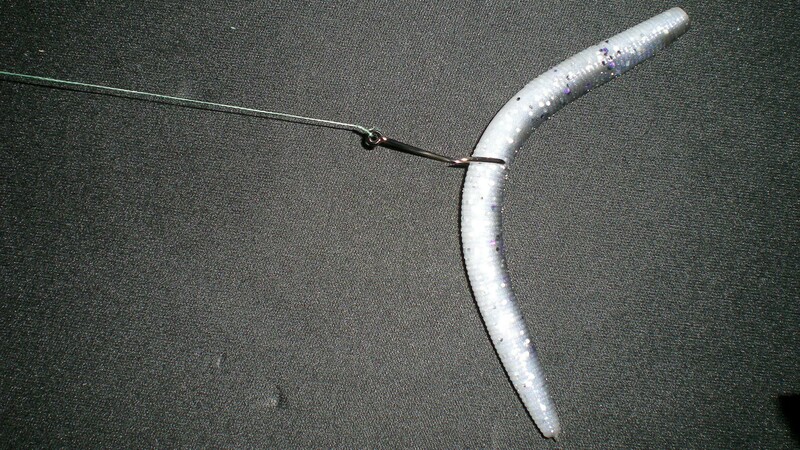 I tend to favor a typical Owner circle hook, size 2/0, along with a 5’’ Senko or a Gulp Wacky Crawler. You can also get rubber rings that go over the worm and prevent tears and losing so many high dollar worms. Drop Shot Rigs – This is a finesse technique that typically requires light line and a spinning outfit. It can catch fish when other reactions baits will not work. To rig it, tie a Palomar knot to the hook, up about a foot or two from the end of the line. Then attach a drop shot weight to the end of the line, anywhere from 1/8 oz to 3/8 oz. Texas rigged worms, tubes, or grubs will work well with this setup. I enjoy using 5’’ Kinami Flash Worms, because of the added weight and aerodynamic casting features they offer. Deep Diving Crankbaits – I am a big fan of deep diving crankbaits during the winter, especially in deep areas of clear water. They tend to work best in clear water because the bass are more aware of the presence of the lure and can stalk it from a deep area before shooting up and taking the lure. The Rapala Shad Rap is a great lure for this type of fishing, and I enjoy working with the Rapala Shad Rap RS (depth 5’-15’), the Shad Rap Hardbait(depth 4’-15’), and the Rapala Shad Rap Jointed (depth 6’-13’). Also the Strike King Bleeding Bait Hook Crankbait Bleeding Gizzard Shad (depth 8’-10’) and Lucky Craft Rick Clunn Deep Diving Crankbaits Model 2.5DD (depth 8’-10’) work very well. For the most part let the lures all drop and work them very slowly. It can help if you rip the lures through areas of heavy cover to provoke some reaction strikes from bass that are holed up in those areas. Shaky Head Jig: Cast it out and let it sink, a lot of strikes will occur on the way to the bottom. Then wiggle the lure without lifting the weight to create action in the tail of the worm, drag it along the bottom. Cast, sink, shake, repeat, then more to a new location. Wacky Worm – Let it sink after casting it out, then slowly retrieve it with erratic twitches to create the action. Drop Shot Rig: Cast it out and make sure you don’t tangle the weight and lure, sometimes adding a swivel can be helpful. Let it drop and then slowly bring it in, keeping the weight dragging on the bottom while throwing in twitches and pops for the worm on the hook. 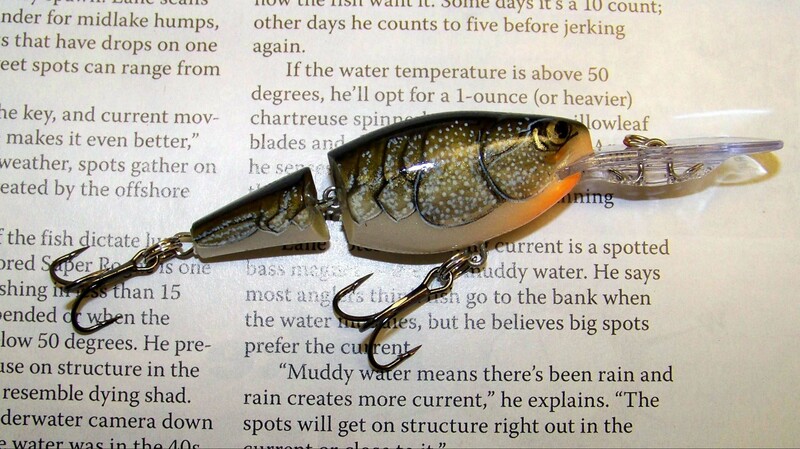 Deep diving cranks – I initially cast them out and crank them fast, sometimes with the tip of the rod in the water to get them down to the desired depth, then just work it very slowly, let it stop and twitch it while it floats up, then begin cranking slowly again. Works very well if the fish are holding close to the bottom in the 15 foot range, and the action imitates an injured bait fish. These fishing tips and techniques will help in conquering the winter bass, however the most important thing is to be patient when you’re out on the water. I certainly feel that winter is the slowest and most difficult time to fish, however it can all be worth it if you are able to hook a bass from the bottom of the lake and fight it all the way to the boat. Keep fishing.